The Organic Dust (Toxic) Syndrome is a potentially severe flu-like syndrome originally described in farmers, mushroom workers, bird breeders and other persons occupationally exposed to dusty conditions. The Organic Dust (Toxic) Syndrome is an inflammatory reaction of the airways and alveoli to high concentrations of small particles of dust. It is thought the syndrome is toxic rather than autoimmune in origin. These particles can be materials such as grain kernel fragments, bits of insects, bacteria, fungal spores, molds or chemical residues. Symptoms arise 4–12 hours after exposure to some type of organic dust, and generally last from one to five days. Common generalised symptoms include fever over 38°C, chills, myalgia and malaise. The most frequent respiratory symptoms are dyspnea and a dry cough, while a wheeze may be present less commonly. 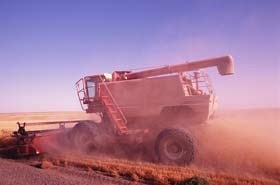 Headache, rhinitis, conjunctivitis and keratitis can also be present, while skin irritation may occur in those handling grain. Respiratory function may worsen to the point where hypoxia occurs, and damage to the airways may lead to non-cardiogenic pulmonary edema one to three days post exposure. The illness is generally self-limiting. Organic Dust (Toxic) Syndrome was only recognised as a distinct clinical syndrome in the 1980s. Previously, cases had been reported and given various names such as pulmonary mycotoxicosis, silo unloader’s syndrome, grain fever, toxin fever, humidiﬁer fever, mill fever, toxic alveolitis or allergic alveolitis.